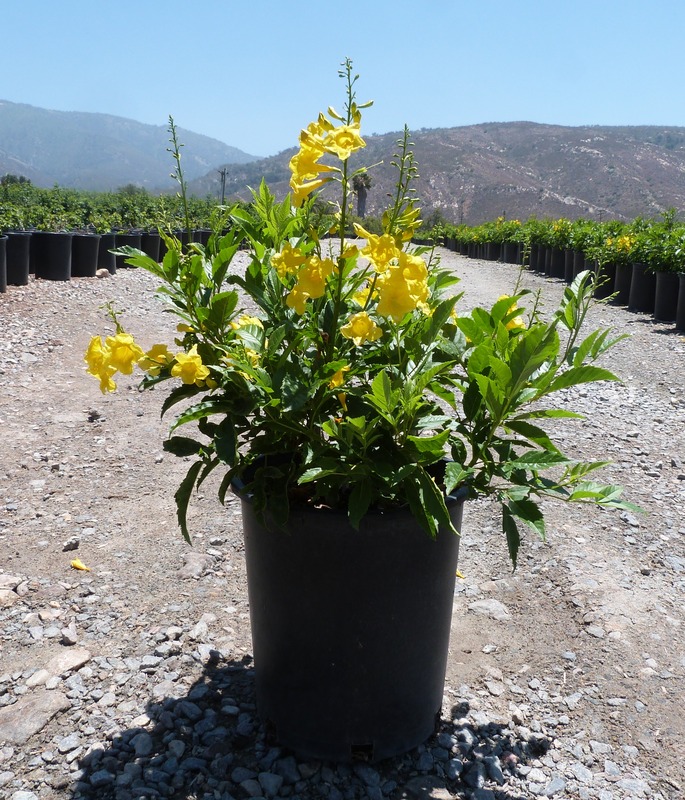 Yellow Bells, also called Esperanza, are fast growing and heavy blooming shrubs. While they will perennialize in warmer climates, yellow bells can be used as an annual in cooler climates. Plants can be evergreen in warm regions and will typically become taller in those areas. Depending on temperatures plants may drop their leaves in winter. The flowers are trumpet-shaped and form in clusters that are 3-5 inches wide, followed by greyish-green seed pods. Plants have a long blooming period that starts in early April and continues through November. The flowers are irresistible to bees, butterflies, and hummingbirds! This shrub tends to flower heavier during drought periods and heat. Plants have an organic, irregular growth habit and are not suited to regular shearing. Their lush tropical foliage adds interest in many differents settings in the landscape. Plants are native to the southwest areas of the United States reaching to Central and South America in a variety of landscape settings. Yellow bells is fairly drought tolerant; be careful not to overwater as this often results in fewer flowers. Newer cultivars are available in a variety of colors, such as orange and peach; other hybrids are more compact in size.